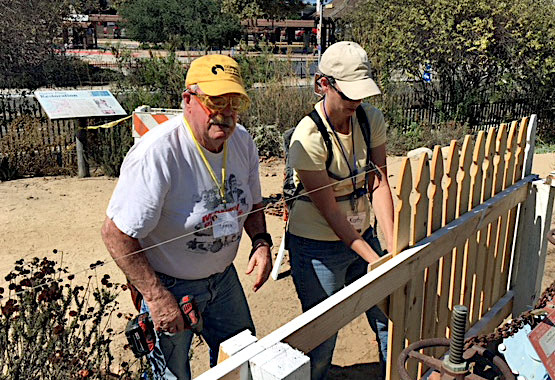 Six Park Champions volunteered alongside Old Town State Park staffers Chad, Susan, and Matt, to rebuild and paint another section of the old wood picket fence around the historic McCoy House, while four other Champions helped CNPS member Kay Stewart remove overgrown black sage from the Native Landscape. The purpose of the landscape is to “re-create a usable, edible landscape-like the one used by the Native Americans who lived here before Europeans arrived.” The work was started in 2006 and at the time the species selection seemed fine. Sadly, large shrubs provided hiding places for people, so the landscape is being “remodeled” to eliminate them. 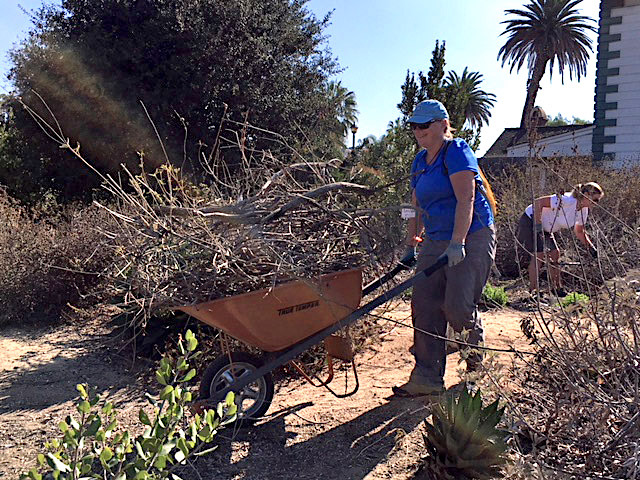 After some irrigation repairs are completed by Park staff, on November 17, at the next Park Champions volunteer work party, CNPS members Kay Stewart and Peter St. Clair will show volunteers how to sow wildflower seeds. Seeds of locally common species of annuals will be scattered in bare spots to result in short-term beautification. Kay and Peter are also planning to replant using plants that will not reach more than 2’ in height and have ethnobotanical value. They hope that funding to replant the Landscape with an estimated 300 plants, at a cost of $2,000 to $3,000, will be found. If so, planting parties in December and/or January will be scheduled.